British radical preacher Anjem Choudary, who is allegedly connected with armed militant groups, decried the new edition as an "act of war" and a "blatant provocation." Many mainstream Muslim organizations also reacted by saying that the mere depiction of the prophet is a sacrilege: Egypt's Islamic body Dar al-Ifta branded the publication "an unjustified provocation against the feelings of 1.5 billion Muslims," AFP reported. "This edition will result in a new wave of hatred in French and Western society. What the magazine is doing does not serve coexistence and the cultural dialogue Muslims aspire to," Dar al-Ifta said in a statement. Sunni Islam's most renowned center of learning, Al-Azhar in Cairo, said that the cartoons "stir up hatred" and "do not serve the peaceful coexistence between peoples." Tabnak, a conservative online outlet in Iran, wrote that "Charlie Hebdo has again insulted the Prophet." Meanwhile, threats immediately appeared on militant websites, urging for more protests against the magazine and anonymous threats from radical Islamists, SITE Intelligence Group, a US-based terrorism monitor, told AP. However, French Muslim leaders have urged members of the Muslim community to remain calm. "What is uncomfortable for us is the representation of the Prophet. Any responsible Muslim will find it hard to accept that. But we shouldn't ban it," said Abdelbaki Attaf, an administrator at the mosque in the Paris suburb of Gennevilliers. The French Council of the Muslim Religion and the Union of French Islamic Organizations have released a joint statement, asking the Muslim community to "stay calm and avoid emotive reactions that are incompatible with its dignity... while respecting freedom of opinion," The Local reported. Charlie Hebdo’s lawyer Richard Malka told French radio that the publication would “not back down, otherwise none of this has any meaning." "If you hold the banner 'Je suis Charlie,' that means you have the right to blaspheme, you have the right to criticize my religion," Malka added. Three million copies – compared to the usual 60,000 a week – have been printed. The first batches have sold out within minutes, with thousands lining up to buy the magazine at newsstands. 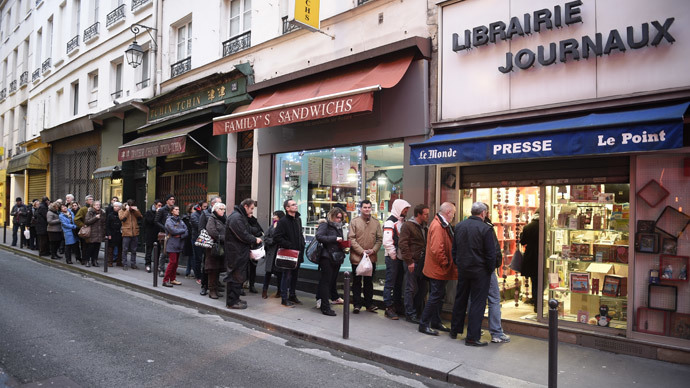 Charlie Hebdo will print 5 million copies of its latest edition to meet high demand, distributors said. "It was incredible. I had a queue of 60-70 people waiting for me when I opened. I've never seen anything like it. All my 450 copies were sold out in 15 minutes," a vendor told AFP. Another vendor told The Local: "There was a queue stretching around the corner from about 6 am this morning. After a few minutes they were gone." "We're hoping we'll get another delivery tomorrow," he added. Charlie Hebdo’s front cover Wednesday shows the Prophet Muhammad shedding a tear while holding a "Je Suis Charlie" sign. The headline reads: “Tout est pardonné” (All is forgiven). "I wrote 'all is forgiven' and I cried," Renald Luzier, who drew the cartoon, told journalists at the weekly's temporary office at the headquarters of the left-wing daily newspaper Liberation. "This is our front page ... it's not the one the terrorists wanted us to draw. I'm not worried at all... I trust people's intelligence, the intelligence of humor," he said. The magazine’s editorial column defends secularism and the right to criticize religions, and the edition ends with a critique of the Pope, AP reported. So far, there has been no official reaction from the French government to the magazine’s new edition.